November 15, 2013– My mom takes my dad to the ER due to large amounts of dark/ almost blackish blood in his stool. He’s lost so much blood, doctors warn me that he might need a blood transfusion. He his admitted to the hospital for 2 days where they perform an endoscopy, a colonoscopy, and x-rays. One small biopsy from the stomach and multiple colon biopsies were sent to the lap. My father is misdiagnosed with diverticulosis, and discharged. November 26, 2013- I call the GI doctor who administered the tests at the hospital to get results from the all the biopsies, and he confirms that all is clear. December 5, 2013- My dad goes to his primary doctor for a follow-up, where he is told that he has gastric adenocarcinoma. December 6, 2013- My dad receives his second endoscopy where he has 8 biopsies sent to the lap. He also has his first CT scan of the pelvis and abdomen. December 17, 2013- My dad gets a PET Scan and a CT scan of the chest. 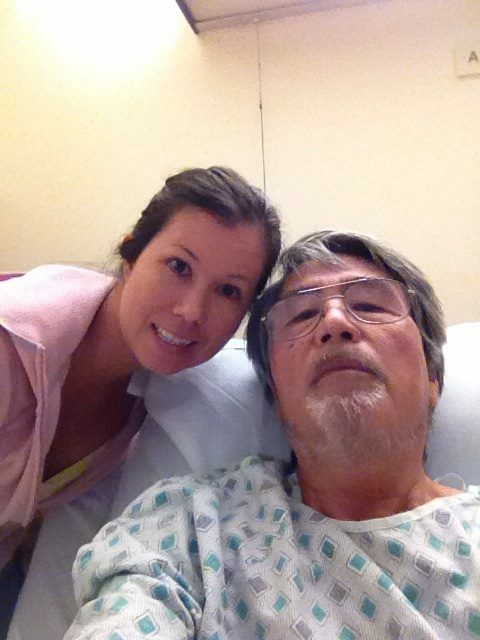 December 30,2013– My dad receives his third endoscopy and an endoscopic ultrasound. The EUS Doctor even gets a biopsy of one of his lymph nodes which turns out to be positive. At this point, we are informed that the tumor is a T3a and that there are three enlarged lymph nodes near it. This confirms that the tumor has broken through at least three layers of the stomach, and was either Stage 2 or Stage 3 cancer. January 2014– During this entire month, results from all the tests were coming in. We were processing all the information and figuring out what would be best. We meet with the surgeon, the GI doctor, and the oncologist. We also went to UCLA for second opinions. In the end, my dad decided it was best to continue his treatment with the a new team of doctors at UCLA. February 20, 2014- Discharged: Final pathology was Stage 3b. April 1, 2014- My dad gets an ECHO of the heart just to monitor it. Chemotherapy can damage the heart. May 21, 2014- My dad goes in for a three month check-up. He gets a CT Scan of the chest and a CT Scan of the pelvis. May 22, 2014- Chemotherapy and Targeted Therapy cancelled due to critically low white blood count. My dad receives Neupogen shots (3 shots to the stomach) to stimulate bone marrow. June 11,2014- 6th Chemotherapy and Targeted Therapy. He also receives Neupogen shots. My dad is on break from chemotherapy although he continues to get targeted therapy every 2 weeks. August 20, 2014- Radiation therapy complete. And the rest is still unwritten….